Rapture Pro is said to be for musicians of all abilities. MUSIKMESSE 2015: Fresh from revamping its Sonar payment model, Cakewalk is getting back into the software instrument game with the launch of Rapture Pro. Combining algorithmic and sample-based synthesis, this ships with more than 1000 sounds in a 10GB library. 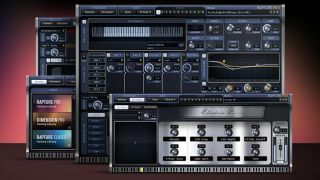 The new instrument has been designed to appeal to all manner of musicians and is based on Cakewalk's original Rapture and Dimension Pro synths. It comes with both Perform and Edit modes so that you can tailor the interface to your requirements. Check out the feature highlights below and find out more on the Cakewalk website. Rapture Pro will be available later this month for PC and Mac and in VST/AU formats. The introductory price will be $149, with discounts for owners of other Cakewalk software also available. This includes those who got the full version of the original Rapture free with issue 200 of Computer Music magazine - the upgrade price for them will be $99 if they take advantage of the introductory offer.